The president of the Commonwealth Games Federation has given politicians until 29 June to salvage Belfast's bid to host the next Commonwealth Youth Games. 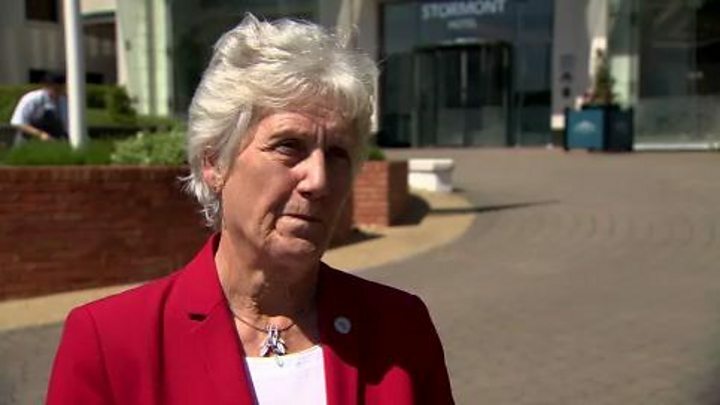 Louise Martin was in the city following concerns that funding for the games had not been signed off by Stormont. Belfast is due to be handed the Games at the closing ceremony of this year's event in the Bahamas on 23 July. About 1,000 young athletes are due to take part in the Games in Belfast in 2021. The Commonwealth Youth Games launched the careers of Carl Frampton and Jessica Ennis, and would be a landmark event for Northern Ireland's centenary year. On Friday, it emerged that the future of the 2021 games was in doubt as funding had not been signed off before the Northern Ireland Executive collapsed. Ms Martin said she only found out there was a problem on that day. "As far as I was concerned, the games were on target. Belfast had a fantastic bid and I couldn't believe what I was reading," she told BBC News NI. During her meeting in Belfast, Ms Martin told politicians that funding must be signed off by 29 June to allow Northern Ireland to take part in the closing ceremony. A delegation from Belfast is to be presented with a Quaich - a ceremonial drinking bowl which is the Commonwealth Games' equivalent of the Olympic torch - at the ceremony in the Bahamas. "We are on a very tight timeline here because the handover ceremony is only 33 days away," Ms Martin said. "We have to have everything signed off by 29 June and money already handed over. We have to have a handover ceremony and hand over the Quaich." She said if funding was not in place it would not be a case of "taking the Games away" from their Belfast hosts. However, she added it would be a case of "not being able to hand the Games over at the closing ceremony to showcase Northern Ireland to the rest of the world and the Commonwealth". Asked about how she felt about the political situation in Northern Ireland, she said that this wasn't a "blame game but it's about finding a solution so we can deliver the games". Northern Ireland's five main political parties attended the meeting but officials from Stormont's Department of the Economy, who had been asked to fund the Games, did not attend. Roy Millar, the chairman of the NI Sports Forum, said it was a very positive meeting and thinks a deal can be done by 29 June. "It can be done because we are already getting in touch with the permanent secretary of the Department of the Economy and the five main party leaders are meeting," he said. "Obviously I'm disappointed that the Department of the Economy wasn't there, but I'm sure they have their own reasons. "It's disappointing when civil servants don't show up to a meeting as important as this." Following Tuesday's meeting the leader of the Ulster Unionist Party, Robin Swann, said it was "actually ridiculous" that the funding had not been signed off. "We've now got time to do it so we can deliver these games," he said. "It's important that our young people have the opportunity to compete in these games." Mr Swann said he has now written to the interim Head of the Civil Service, David Sterling, and the chairman of the Stormont talks, Sir Malcolm McKibbin, to "try and remove the blockage". Chris Lyttle, Alliance Party MLA, said he was grateful that Ms Martin had come to Belfast for the meeting. "We gave our assurances that the people of Northern Ireland are ready to deliver an outstanding Commonwealth Youth Games," he said. "We will be doing all we can to make sure that the handover does take place in July."